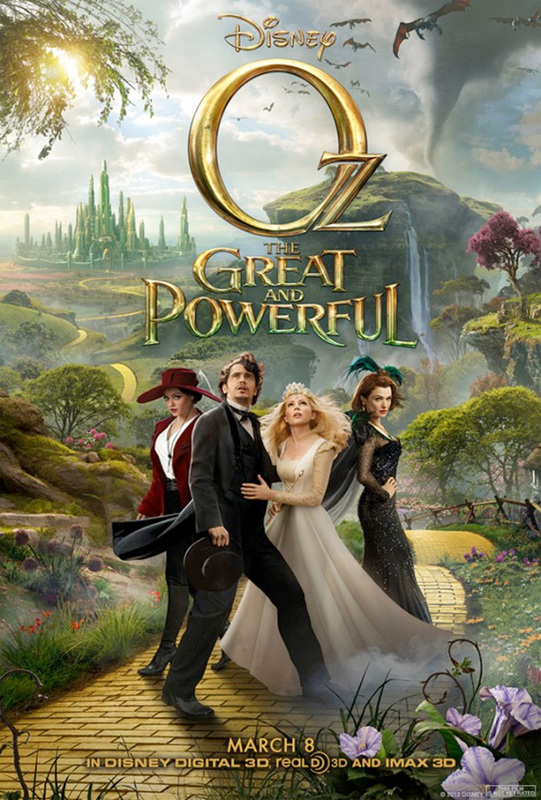 Oz the Great and Powerful is Sam Raimi’s prequel to the beloved Wizard of Oz. The story begins in Kansas at a traveling circus with James Franco playing the role of Oz, a stage magician who performs for the small towns that he finds himself in but dreams of greatness and fortune. A despicable man, Oz considers himself more of a con man than a magician, playing tricks on the hapless people in order to get their money. His one con goes too far and he flees the traveling circus in a hot air balloon that ends up getting caught in a horrific tornado. Tossed and weatherbeaten, eventually the turbulent winds calm and Oz finds himself in the magical land of, well, Oz. He meets a beautiful witch by the name of Theodora, played by the delightful Mila Kunis. What follows is a roller coaster ride of an adventure, full of strange enemies and even stranger allies. With healthy nods to the source material and a reverence for the joyful discovery of magic and wonder, Director Sam Raimi manages to deliver a fun-filled epic for all ages. Franco is very effective as the smarmy Oz, his slightly villainous grin playing very well with the role of the conflicted prestidigitator. Mila Kunis and Michelle Williams are great in the roles of the warring witches, but the best performance comes from Rachel Weisz, playing the role of Evanora with devilish sinister and wicked delight. Casting choices aside, the true mastery that shines in this movie is Raimi’s ability to navigate the waters of a well loved movie landscape without falling into simple nostalgic revelry. The movie stands on its own; it’s full of great moments and memorable characters as well as eye-popping visual effects. Helmed by a lesser director, though, I don’t think that this movie would have managed to keep its almost childlike innocence. Raimi not only manages to maintain that feeling, but cherishes it, embraces it and allows it to shine throughout the movie. Given Hollywood’s current trend of revamping traditional fantasy tales without the fun, Oz the Great and Powerful reminds me of what it’s like to believe in movie magic again, even if only for a moment. Oz the Great and Powerful opens today in Philly-area theaters.